The accessory we’re looking at today is The Ivory Triangle, published in 1993. It is a boxed set that includes 3 softcover books; two run for 32 pages and one runs 96 pages. Included are two foldout maps and 6 reference sheets. In addition, there is a short story booklet running 16 pages. 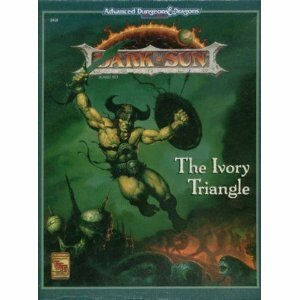 As expected it covers the Ivory Triangle region of Dark Sun. The large book is entitled The Ivory Triangle and covers the same region as in the 4E version of the rules. The first of the smaller books is The City-State of Gulg and the second is The City-State of Nibenay and they each cover their respective cities. Merchant Forts are outposts of merchant houses which act as supply and trading posts throughout the region. There are 4 forts listed in detail: Fort Harbeth, Outpost 19, Fort Inix, and Fort Fyra. In addition, there is a listing for The Cache, a location of the Shadows which is used as a training ground. Each Fort has a series of topics included for the location. First up is a short description of the Fort; who owns it, the trade route it covers and a general overview. Next is a history of the Fort, which is followed by a discourse on the condition of the Fort Today. This tends to be general information, though there are enough details to provide for some adventure ideas. For example, Fort Harbeth is well known as dealing in “nomad trade” and the intrigues associated with that. Also the master trader of the post does not allow thri-kreen inside the post and this could be the catalyst for an adventure. The level of the Garrison for the Fort is listed next. This covers the number of defenders and approximate levels. It also describes the physical defenses of the location, such as any walls or special weaponry. Next up is a section entitled Personalities. This provides the names, stats and backgrounds of the major NPCs for the location. The stats can not be used as they are listed, though they can give some ideas of class and level. However, the backgrounds are fairly detailed and can be used as adventure ideas. The description of the Fort is concluded by a map of the Fort which includes a numbered listing of the buildings. Again, it’s nice to have this level of detail as it makes adventure generation that much easier. The Cache is written up as all the other Forts, but is not a merchant house’s post, nor is it public knowledge. It is an organization and location not mentioned anywhere in the 4E sourcebook, but its inclusion will not disrupt a 4E campaign. It can however, be an excellent location for a mission to find and penetrate the site. None of this information is listed in the 4E sourcebook. The merchant houses making use of the Forts are mentioned in the 4E book, but the actual Forts are not. This then provides additional material for a GM to use. Here we find 3 raiding/slave tribes that operate within the region. The first section starts with a look at the Organization, which lists the movers and shakers of the group and lists any conflicts or intrigues taking place within the organization. The book next discusses Operation and Means of Existence; this lists what the tribe is well known for and what they might trade in. Following this is the Origin of the group. We then get its Location and Defenses. Next up is a numbered map with corresponding location descriptions. They follow that up with Relations with Others and how a person can go about Joining the Tribe. The section then ends with Important Tribe Members. First up is Salt View, which is mentioned within the 4E sourcebook. The 4E book spends one long paragraph on Salt View. The 2E book spends 8 pages discussing Salt View. The basic premise of the tribe is the same between both books (a tribe in transition well known for their entertainers). The 2E book has a lot more detailed information that would make using the tribe easier and more in-depth. There are also a bunch of adventure ideas that can be gleaned from the various descriptions. The second tribe is Losthome. The description of the tribe (halfling slave escapees from Gulg that have set up a home in the Crescent Forest) matches exactly the description for the Lostspears in the 4E book. The only difference, other than the name, is that the Losthome halflings have a set base of operations and the Lostspears wander the forest. You could easily use the Losthome information in place of the Lostspears information (or decide that the two are related-the Lostspears and Losthome are the same halfling escapees but one splinter group prefers to wander while one prefers to establish a home base). The Losthome information is again full of useful details that make their use easier. The third tribe is Poortool’s Horde. This is unique to the 2E book and has no corresponding tribe in the 4E book. It is a raiding tribe that openly uses magic. There is a lot of good adventuring material here and since it is additive to the 4E book it is of good use. Here we start to read about the wilderness of the region. Each section gives a general overview of a sub-region or the area. This is followed by Flora and Fauna, which obviously describes the local plant and animal life. The next section is Travel and describes any travel hazards including such things as availability of water. Next we get some random Encounter tables. This and the next section, Inhabitants, are of limited use as some of the monsters are not found in the Dark Sun Creature Catalog. However, a simple reroll will likely get you a creature you can use; at the very least the table can give a GM some good ideas. The sub-regions are the Windbreak Mountains, Crescent Forest, Verdant Belt, Great Ivory Plain, and Mekillot Mountains. The 4E book does not mention the Verdant Belt as a sub-region specifically, though it does briefly mention a verdant belt in the same location as listed by the 2E book. They can be assumed to be the same. Much of the information between all the sub-regions in the 2E book and the 4E book are virtually the same. For example, the druid Barazin (4E book) functions exactly the same as Brazin (2E book) as to his relationship with the Crescent Forest and outsiders. There is some additional information about the Verdant Belt that is not covered at all in the 4E book and this is a description of various famous Battlefields within the region. 5 battlefields are described and they would make excellent backgrounds for an adventure. For example, the Clearing War describes a fight over control of a ruin within the Crescent Forest that saw Nibenay himself participate. The description makes mention that after the battle the ruin was never explored and still lies within the forest; an interesting adventure location. There is also a unique bit of information about the Great Ivory Plain in the description of the Poisoner’s Pit. This is about a NPC who is renowned for his assassinations and use of poisons. His lair is mapped out and the numbered rooms are given detailed descriptions. In total, this is a well written adventure location with interesting NPCs to interact with. There is some information unique to each sourcebook, but the disparate facts can easily be meshed together to weave a rich tapestry of adventure. The Ivory Triangle sourcebook finishes with 4 monster descriptions; the Bloodvine, Cilops, Athasian Treant and Salt Zombie. The Cilops and Salt Zombie appear in the Dark Sun Creature Catalog. The Treant is almost the same as regular Treant, except they can not animate trees. The Bloodvine would make for an interesting monster write-up. We now have 32 pages to describe the city of Gulg, whereas the 4E sourcebook had 4 pages. Most of the information is “fluff” so it really works great at increasing the ability to prepare adventures with fine detail in Gulg. Since the booklet is relatively short there are no chapters, but rather topic headings. First up is a general overview of the city and reads much the same as the opening part of the 4E book. The second section describes Gulg Society. It goes into the concept of the dagada. This information is exactly like that found in the 4E book, only in greater detail. It goes into details on the dagada societal structure, how people interact with each other, the concepts of ownership of property, education, rites of passage, concepts of the supernatural, funeral rites, marriage conventions, entertainment, dining, dress, cultural identity (art, sculpture, architecture, literature, stories) and time keeping; how the people of Gulg live on a daily basis. It is rich in detail and really helps to bring forward the lifestyle and feel of Gulg. Included are sample maps of a dagada, a family compound and a public dagada (which is the one non-Glug players will likely be interned at). The next section provides information about the People of Gulg, specifically the various levels of social strata within the city-state. There are the Free Citizens, Hunter Nobles, and Slaves. Details are given as to the occupations and responsibilities each level of strata has. Next up is the section dealing with City Life. It starts with a brief overview of the layout of the city. It then goes into a few locations, such as the City Gates, Marketplace (complete with a sample of a market and a description of the merchant House Inika) and goes over the topic of Citizenship. The last topic goes into the three basic rights of every citizen (called the Three Great Gifts of the Oba); this details how the rights benefit the citizens and then how the same rights benefit the Oba. This section provides for some interesting insight into how the city functions amongst itself and carry’s some good adventure ideas; such as the Citizen’s Stone (a token that serves as proof of citizenship) which could be the object of a quest if it was lost or stolen. After that we have a section describing the Life in the Oba’s Court. This goes into detail about the ruling templars and nobility, specifically the Paper Nest, which is briefly mentioned in the 4E book. It also lists Gulg’s Army, but since this uses the Battlesystem for its stats it is of little use in a 4E game. It also mentions what to expect when trying bribery and how the city reacts to Smuggling Spell Components. The section ends with a few paragraphs on the Bone Village. This was mentioned in the 4E book, but goes into a bit more detail here. Next is Races and Characters in Gulg. This section answers any questions on how specific races and classes fit in within the city. 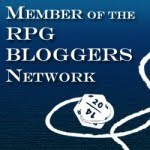 While not all the classes and races are the same between 2E and 4E, there are enough similarities to allow a GM to make use of the information. The book ends with a couple of paragraphs on the Order (a secretive psionic organization) and the Veiled Alliance. The 4E book has some information that the 2E book does not and vice versa but meshing the two together should not be any problem. Similar to the Gulg book, this one starts out with a general overview and history of the city. Immediately you get a better sense of the city than in the 4E book, which describes a greater focus on mercantilism than the 4E book does. The first section is about the Nibenese Society. It starts with a discussion of the Ancestral and Elemental Cults. This is a direct departure from the Gulg outlook on spirits and so helps to understand some of their differences. From there we go into Dress, Cultural Identity (Dance, Sculpture, Architecture, Art, Literature, Astronomy) and end with their Calendar and Holidays. A calendar is provided for the GM to copy and use to track information on a daily basis. The next section is the People of Nibenay. This is divided into 3 main section; Free Citizens, Nobility and Slaves. Each section covers the same smaller topics of Marriage, Ownership of Property, Occupations, Typical Residences, Routine, Education, Entertainment, Dining, Funerals. Each class of people has a different way of doing things and this helps to better understand the differences and would make portraying such a NPC easier for a DM. Included is a map of two Freeman’s Dwellings and one of a Noble’s Dwelling. This would come in real handy if the player characters had to infiltrate a noble’s home to recover something. The section ends with a couple of paragraphs on the Elderly, Outcasts and Criminals. City Life is the next section detailed in the book. Again it starts by giving an overview of the layout of the city. This section is divided into further sub-sections detailing the City gates, Commerce and the Marketplace, Citizenship, the Farms. There is a good bit of information here that can be used as an adventure catalyst. For example, the psionic School of Augurs is mentioned under the Commerce sub-section as it provides a trade by having a telepathic message delivery service. Imagine if a wild talent psionic “overheard” something they were not supposed to and the players become involved. We can’t discuss Nibenay without taking a look at Life in the Shadow King’s Court. There is a brief description of the Naggaramakam followed by a discussion about the Templars, his “wives”. The section goes into the Government Structure; it divides the organizations into 5 sections and delineates them by a Chamber (an elemental tie-in) and a Temple (a building). This is almost exactly the same as in the 4E book, even down to the names of the templars in charge of the particular organizations, except for the Temple of War where the name of the templar in 2E is Arru and the 4E name is Bamandji. One other difference is that the 4E book changes the names of the organizations away from elemental ones. The 2E book also mentions that the Nibenese revere the elemental spirits (in contrast to Gulg). Perhaps the 4E setting is trying to distance the sorcerer-kings away from the elemental aspect of the 2E setting. There are a few paragraphs dealing with Siemhouk, the child templar, and gives her a special reason for being Nibenay’s favorite. The section also goes into Nibenay’s Army, detailing a couple of the city’s special units. Mention is made of a Monastic Movement, a call to a more austere way of life and provides a couple of adventure seeds therein. The section ends with notes about the Order, Veiled Alliance, Bribery and Smuggling Spell Components. The book ends with a section on Races and Characters in Nibenay. It gives a brief overlook of how the races fit into the city and then goes more into depth of how the classes fit in. Of note is how the magic-users fit, or rather don’t fit, in. The 2E book has a lot to offer a GM and will easily fit into a 4E setting. There are 6 reference sheets included in the box set. One provides a Merchant’s Calendar and a table for the frequency and chance of wilderness encounters. The calendar shows various constellations and how they fit into the timekeeping of Tyr. 2 sheets are DM notes of important information for each city. They provide locations and names that the players are likely to run across. Of note is the fact that a lot of the information is not found in the books. 2 sheets are information packets for travelers and outsiders that are visiting one of the two cities. A bunch of the information is covered in the books, but some of the cultural stuff is not. For example, in Gulg it is a crime to look directly at the queen’s palace, the Sunlight Home. The last sheet is a pricelist for items in Nibenay. There is no corresponding sheet for prices in Gulg so I am assuming the prices are similar. However, the price list is of little use in a 4E setting as the prices are too different (perhaps someone will make a money conversion chart between the two versions of Dark Sun). The list can still be used to get an idea of what commodities are available and their relative prices to each other. There are two large foldout maps. One has the two cities on it with key locations marked on them. The second map is of the Ivory Triangle and shows the locations found inside the books. As such it shows more than the map with the 4E setting. However, the maps are extremely compatible. Most of the artwork is done by Baxa. I have never been a fan of his artwork, so my opinions will be tainted. There are about 48 pieces of artwork of which very little can be photocopied and used as scene setters. There are some portraits that can be used when introducing certain NPCs, but overall the art will not be of much use. Overall: A lot of the information is generic enough to allow easy use with the 4E setting. That is not to say the details are not there, but rather that not a lot of space is given over to stats. The books are full of fluff and have very little crunch which is good when trying to integrate them into a 4E campaign. Despite the sourcebook coming out later in the lifetime of the setting, the information given does not deal with a lot of the timeline of Dark Sun and thus can easily be inserted into a 4E campaign, without messing with the “canon” setting. The information augments the written 4E material and gives a GM a lot more information and details he can use in his own campaign.